Everybody seems to love my new collection of Fleur de Grunge designs so I am delighted as it took me a long time to design them and get the right look. 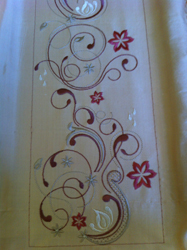 After embroidering Fleur de Grunge last week and adding cystals I thought I would try another colour scheme as I was testing out one of the mega designs from the 4th set. As you can see I do not hoop my fabric, only a layer of stabiliser with an extra layer on top, and then I attach the almond silk fabric with temporary adhesive (keep it well away from your machine) and an outline of basting stitches which is a function on my machine. 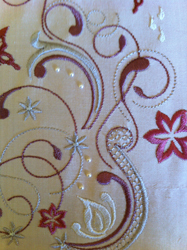 If you do not have this function not to worry as the 2nd set of OAS stitches on all my recent designs does the same. I chose Sulky Rayon thread colours 1304, 1085, 1213, 1071 and 1313. 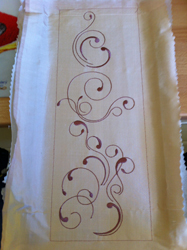 I quite like the first colour 1213 (Taupe) stitched out on its own. It looks quite elegant and I would like to encourage you to experiment with the colours of my designs and try eliminating some to see how different they can look! If you want a more open design this may work perfectly for you. 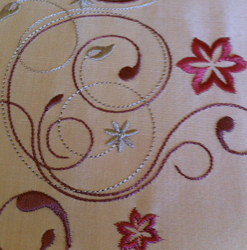 Having used a darker thread I choose a lighter one 1085 (silver) for the 2nd colour to give a contrast. While the 3rd colour 1213 (Dewberry) was stitching out my bobbin warning came on, so I cut my threads and removed the hoop to replace the bobbin. Although technically this can be done with the hoop in situ it is not my practise. 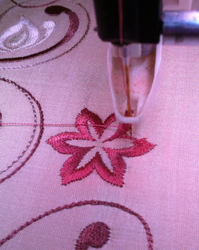 However I failed to check to see where the machine had stopped and did not notice that I was a few stitches from the end of one of the large satin flowers. 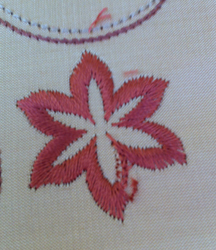 When I had replaced the new bobbin and continued stitching I noticed that I had untidy stitches and a gap on this flower. I should have finished the large flower when the machine put up the bobbin empty message or moved back a few stitches after changing the bobbin but I was obviously not concentrating. As I was taking photos of my progress I decided to use this opportunity to show you what I do when such an error occurs. 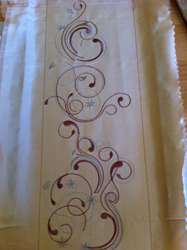 Then I put the hoop back on to the machine and scrolled through my design to find the exact place where I went wrong. I find it particularly helpful when moving the needle to lower it just above the stitching so I can see where it will pass through the fabric. Sometimes if it is high above your work it is not easy to see its postion so clearly especially if there are lots of small stitches. 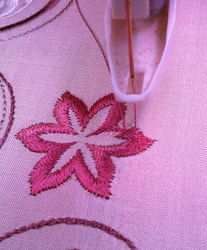 As I start the embroidery I hold the thread over the area to be stitched so that it is caught and held in place by the stitches making it secure. 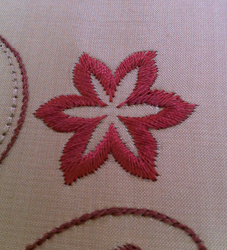 I completed the flower and the stitches are all repaired and secure. I then moved on through the colours in my design. I used 1071 (off white) for the raindrops and stayed with 1313 (Bittersweet) for the butterflies. I think you will agree that in small groups around the curves they fit perfectly. As this worked well I decided against adding crystals to the antennae of the butterflies. It is very easy to over do the addition of crystals and pearls. There are so many uses for these designs but I think that they would be wonderful on your favourite pair of jeans with the addition of hot fix crystals too! 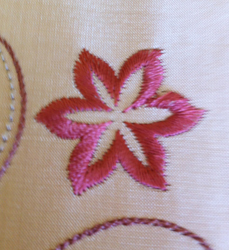 Thank you for visiting my sewing studio and seeing what I am working on at present. Next time I will be showing you a wonderful 3 dimensional card that I made for my sister’s birthday! 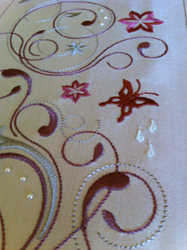 In the meantime I hope your visit has inspired you to embroider today. Hazel, Thank you so much for this useful tutorial! 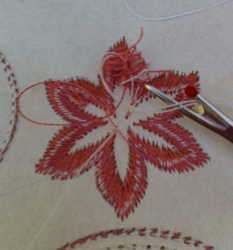 Was happy to learn how to fix a mistake as we all have our moments plus to hear your thought process as you are stitching a design. It is such a fun collection and the pearls are a perfect touch! Love the new design, it is where you really show your talents, it is like you have a new freedom of relaxing and enjoying the work of beautiful art that you are capable to do. Hazel one of the things I was told to do early on learning to use my embroidery arm is to keep a regular lead pencil, mechanical is fine, by my machine. When I get the bobbin or thread broken alert the first thing I do before touching anything else is to grab the pencil and write the stitch number on the top of my machine. It helps that my machine is white but that way I don’t misplace the piece of paper I wrote the stitch number on since I am not the neatest person in the world nor am I organized. When everything looks good to go I erase the number. 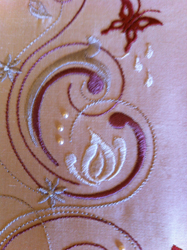 And yes sometimes I have two or three numbers up there in order but it let me know quickly where to start looking when the embroidery finished and I had a gap where thread was re-threaded or bobbins were changed.